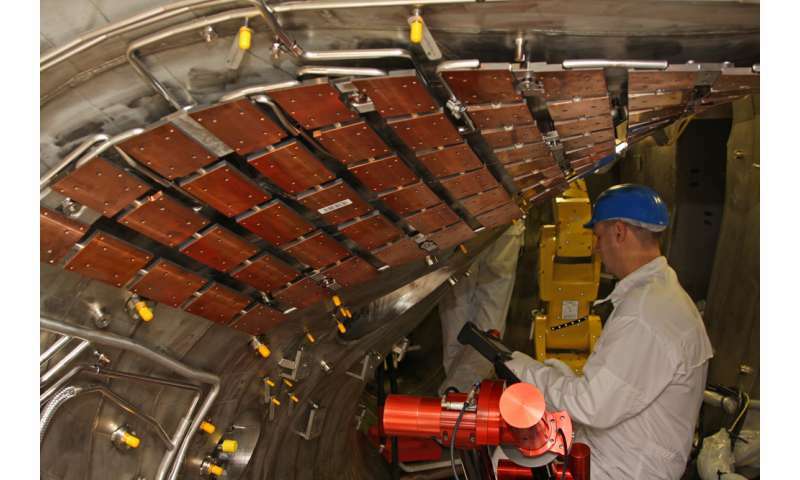 After about 2,200 plasma pulses since operation began in December 2015 the first experimental campaign on the Wendelstein 7-X research device at Max Planck Institute for Plasma Physics (IPP) in Greifswald was successfully concluded in March. Modifications in the plasma vessel are now proceeding to make the device fit for higher heating powers and longer pulses. Wendelstein 7-X, the world's largest fusion device of the stellarator type, is to investigate the suitability of this configuration for use in a power plant. Since the start of operation in December 2015 plasmas have been continuously produced in Wendelstein 7-X - first from helium gas and, since February 2016, from hydrogen. A tiny quantity of gas has been transformed about 2,200 times by microwave heating into an extremely hot plasma of ultra-low-density, this involving separation of the electrons from the nuclei of the helium or hydrogen atoms. Confined in the magnetic cage of Wendelstein 7-X, the charged particles levitate between the walls of the plasma chamber with almost no contact. "We are more than satisfied with the results of the first experimental campaign", states Project Head Professor Thomas Klinger. Starting off from the then attainable pulse length of half a second, pulse lengths of six seconds were ultimately achieved. The plasmas with the highest temperatures were produced by microwave heating powers of four megawatts lasting one second: At mean plasma densities the physicists were able to measure temperatures of 100 million degrees Celsius for the plasma electrons, and 10 million degrees for the ions. "This greatly exceeded what our rather cautious predictions had led us to believe", says Thomas Klinger. Moreover, the structure and confinement properties of the novel magnetic field proved in the first tests to be as good as expected. Further physical investigations, e.g. on the heat load distribution at the wall or on the influence of the external trimming coils, were accompanied by technical discharges for cleaning the plasma vessel or checking the machine systems, viz. magnets, cooling system, microwave heating and machine control. The experiments were concluded as scheduled on 10 March. Meanwhile the plasma vessel has been re-opened in order to mount 6,000 carbon tiles to protect the vessel walls and insert the divertor: The tiles are installed on the wall of the plasma vessel in ten broad strips conforming to the winding contour of the plasma edge. This is because at the edge of the plasma vessel energy and particles encroach on limited sectors of the vessel wall. If these wall sectors are protected by special divertor plates, the impinging particles can be neutralised and pumped off along with undesirable impurities. This makes the divertor an important tool for controlling impurities and the density of the plasma. The wall elements and their support structures were designed and manufactured at IPP in Garching in cooperation with external companies. Installation of the 6,200 differently shaped wall tiles and 10 divertor modules must be done to a precision of one to two millimetres, this being no easy matter in the asymmetric plasma vessel: "After exact measurement of the inside wall we therefore compare the wall dimensions with the tile measurements by a numerical method and modify, where necessary, the tiles with a computer-controlled milling cutter", explains Mathias Müller from Greifswald's Technical Services. Installation will last till mid-2017: Wendelstein 7-X with clad wall will then be fit for high-power plasmas with heating powers of up to eight megawatts lasting ten seconds. 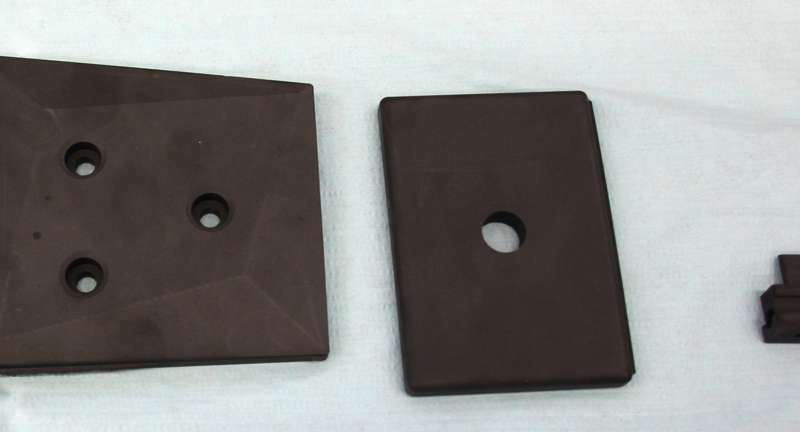 After thorough testing of the divertor function the graphite tiles in subsequent extensions are to be replaced by carbon-fibre-reinforced carbon elements that are also water-cooled. In about four years this will make discharges of up to 30 minutes possible in which it can be checked at a heating power of 10 megawatts whether Wendelstein 7-X can also permanently achieve its optimisation objectives. The aim of fusion research is to develop a power plant friendly to the climate and environment. Like the sun, it is to derive energy from fusion of atomic nuclei. As the fusion fire does not ignite till temperatures of over 100 million degrees are attained, the fuel, viz. a low-density hydrogen plasma, ought not to come into contact with cold vessel walls. Confined by magnetic fields, it levitates inside the vacuum chamber with almost no contact. The magnetic cage of Wendelstein 7-X is formed by a ring of 50 superconducting magnet coils about 3.5 metres high. Their special shapes are the result of sophisticated optimisation calculations. Although Wendelstein 7-X will not produce energy, the device is to prove that stellarators are suitable for power plants. With Wendelstein 7-X it is intended to put for the first time the quality of the plasma confinement in a stellarator on the same level as competing devices of the tokamak type. With discharges lasting 30 minutes the device is also to demonstrate the essential advantage of stellarators, viz. their capability for continuous operation. Why so long to fit the tiles? I understand the precision involved. But one year for 6,200 tile (~17 a day)? Sounds like they could use more funding. While they are doing their grossly-expensive diddling, my PV panels have been providing clean and cheap power, with no maintenance. By the time we get fusion, we won't need it. Evidence says you dont own such a system. Please provide some that isnt pictures of the installation on your neighbors roof. Also please explain why there is no record of your EV at the DMV. Also explain please why george kamburoff keeps providing evidence which suggests that he is a lying cheating psychopath. "The aim of fusion research is to develop a power plant friendly to the climate and environment"
-The aim of fusion research is to learn how to create, store, manipulate, and transport materials such as antimatter in plasma form. So much the better if it creates usable energy.